The Sony CyberShot RX10 III is the highest quality, most versatile all-in-one digicam we have seen to date. The combination of features, versatility, and quality make this a camera that will grab the interest of consumer and professionals alike. Read more in our Full Conclusion. Sony's acclaimed RX camera line has a new ultra-telephoto zoom model for Spring 2016. The Cyber-shot RX10 III (or Mark III) replaces the RX10 II and boasts a 25x optical zoom range with a 35mm equivalent of 24-600mm. Even better, maximum aperture on the ZEISS Vario-Sonnar T* lens is a wide F2.4 to F4.0, with the circular aperture built to provide excellent Bokeh between F2.4 and F11. Optical SteadyShot Image Stabilization -- a must with this zoom range -- comes standard, with Sony noting that it gives up to 4.5 stops in compensation. Minimum focus distance is a short 72 cm (2.36 ft) at full telephoto, or 3cm (0.10 ft) at wide angle. 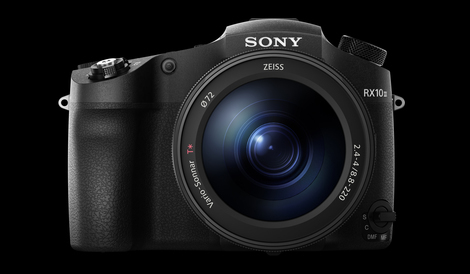 The heart of the new RX10 III is a back-illuminated 20.1-megapixel 1.0-inch type stacked CMOS image sensor mated to the BIONZ X image processing engine, which makes this camera fast-fast-fast. 14fps continuous full-resolution still shooting. 0.09 second high speed auto focusing. A 1/32,000th of a second shutter speed. And, a super slow motion video recording at up to 960fps. Speaking of video recording, The RX10 III can shoot 4K or Full 1080p videos at up to 100Mbps or 50Mbps bitrates, respectively. Cinematographers can adjust picture settings in Picture Profile, S-Log, and S-Gamut, and choose to include Time Code with recordings. The external mic input and headphone out are also helpful tools for video buffs. Ergonomically speaking, the RX10 III sees a number of improvements over the RX10 II, including a revised hand grip better suited for steadying this longer lens. There's also a focus hold button to keep focus locked on a particular subject as you reframe the shot, as well as triple manual lens rings allow users to independently adjust focus, zoom, and aperture settings on the fly. They've also included dust and moisture resistance for using the new RX10 III in demanding environments. Lastly, like most 2016 model cameras, the RX10 III includes built-in Wi-Fi & NFC technologies for use with Sony's PlayMemories Camera apps ecosystem. The Sony Cyber-shot RX10 III sports a retail price of about $1,500 USD. See our best price box at the top of this page to see current online pricing.